The Men They Couldn’t Hang came together in 1984 to perform at the alternative music festival in Camden town alongside the legendary Pogues and the Boot Hill Foot-Tappers. Paul Simmonds, Philip ‘Swill’ Odgers and his brother Jon, veterans of the Southampton based pop-punk band ‘Catch 22’, met Pogues roadie Stefan Cush whilst busking in Shepherds Bush in London. Their early line up was Stefan Cush (Vocals, Guitar), Paul Simmonds (Guitar, Bouzouki, and Keyboards), Philip Odgers (Vocals, Guitar, Tin Whistle, and Melodica), Jon Odgers (Drums, Percussion) and Shanne Bradley (Bass, Flute). Championed by the late John Peel their first single, a cover of Eric Bogle’s ‘Green Fields of France’ (1984), became a big hit on the UK Indie charts and a staple of Peel’s festive 50. Their first album, “Night of a Thousand Candles”, was released in 1985. It includes the singles ‘Ironmasters’ and ‘Greenback Dollar’. Signing for MCA the following year, they recorded their second album, “How Green Is the Valley”, produced by Mick Glossop. Included on this album are the singles ‘Gold Rush’, ‘Shirt of Blue’ and ‘Ghosts of Cable Street’. In 1987 Shanne Bradley left the band and was replaced by Ricky McGuire, famous for touring with punk legends the UK Subs at the tender age of 17. With their third release in 1988, “Waiting for Bonaparte”, The Men They Couldn’t Hang were starting to achieve recognition across Europe for their political comment and raucous live shows. One year later, they followed up the success of “Waiting for Bonaparte” with their fourth album, “Silvertown”. In 1989 they played to over 250,000 people in Estonia as communism started to crumble and followed this with an unforgettable Reading Festival appearance. At the height of their career, TMTCH recorded the brilliant “Domino Club” (1990) produced by Pat Collier, however, this was to be their last studio album for a while as in early 1991, after a blistering farewell tour the band called it a day. 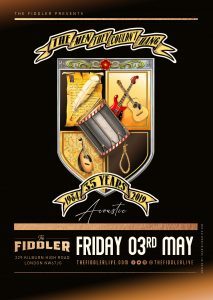 The split didn’t last long as the band were invited by Vince Power to appear at his 10th anniversary celebrations for the Mean Fiddler venue in London and the band performed occasional gigs including a fantastic 2 ½ hour 10th anniversary gig of their own in 1994. By 1996 much to the delight of their fans, TMTCH reunited permanently. They returned with a new power and excitement to their music. “Never Born to Follow” is an excellent work which includes the single, ‘The Eye’. Shortly after this, they released the “Six Pack EP” (1997), followed by their ‘Best Of’ collections, “Majestic Grill” and “The Mud, The Blood And The Beer” (both 1998). In 2003 the band released the self-produced album “The Cherry Red Jukebox” to much critical acclaim and this was followed by the Pat Collier produced “Devil on the Wind” in 2009 featuring long-time associate Bobby Valentino on fiddle and introducing Tom Spencer of the YoYos and the Loyalties fame, son of musician and author the late John B Spencer on banjo. The band spent much of 2010 and 11 touring this across the U.K. and Europe including festival appearances alongside The Levellers and headlining a roots festival in Slovenia. 2012 saw the release of an album from Stefan Cush’s new band, “the Feral Family” and Paul Simmonds was recording and touring with renowned roots singer Naomi Bedford as well as numerous live dates for TMTCH. The latter including appearances at Mike Peter’s “The Gathering”, and festival appearances alongside Billy Bragg and Adam Ant to name but a few. They headlined the 10th anniversary commemoration of Joe Strummer’s Acton Town Hall show which also featured a special guest appearance by Hard Fi. 2013 saw the release in March of Swill’s solo album – The Godforsaken Voyage – produced by the legendary Mick Glossop. As well as appearances by the band at several festivals, including the Folkpunkrock festival in Berlin in February, they were pleased to do a tour of the UK in the Spring supporting Stiff Little Fingers which included St Patrick’s Night at Glasgow Barrowlands. 2014 marked the band’s 30th anniversary and the band saw out their anniversary year with the release of their ninth album, “The Defiant” which was funded via a successful Pledge campaign that raised over 200% of its target and was produced by Pat Collier. Recorded during savage bouts of drinking, mess, ribald reminiscence, raucous recreation and a week of bed and board at a South London flophouse, it features such traditional themes as piracy, fascism, fishing and a little touch of romance in Henry V’s invasion force of 1415. It undoubtedly reinforces the band’s reputation as both originators and unique pillar of the roots rock renaissance, as well as one of Britain’s finest ever bands. Previewed with a sold out London show at Shepherds Bush Empire in April that won rave reviews in The Guardian and on The Arts Desk, the teaser ‘Night Ferry’ EP that saw significant specialist airplay on BBC Radio 2, 6 Music, BBC Scotland and BBC Wales, plus a number of summer festival appearances. They closed their 30th anniversary year with another show at the Shepherds Bush Empire on Easter Saturday 2015 before launching into various festival appearances during the summer, finishing in December with 2 sell out shows at the Borderline and the return of Jon Odgers on drums. 2016 saw more shows and festival appearances including a return to the Rebellion festival in Blackpool during August and sold out shows in Glasgow, Derby, Manchester, Perth and Winchester before ending the year with 2 shows at Londons Borderline where a mix of songs old and new were performed, some for the first time in 20 years. Swill also launched his own successful Pledge campaign to make an 18 track album available to Pledgers, the commercial version of which has just been released called Roll to the Left the album is available via Amazon and all good music retailers. 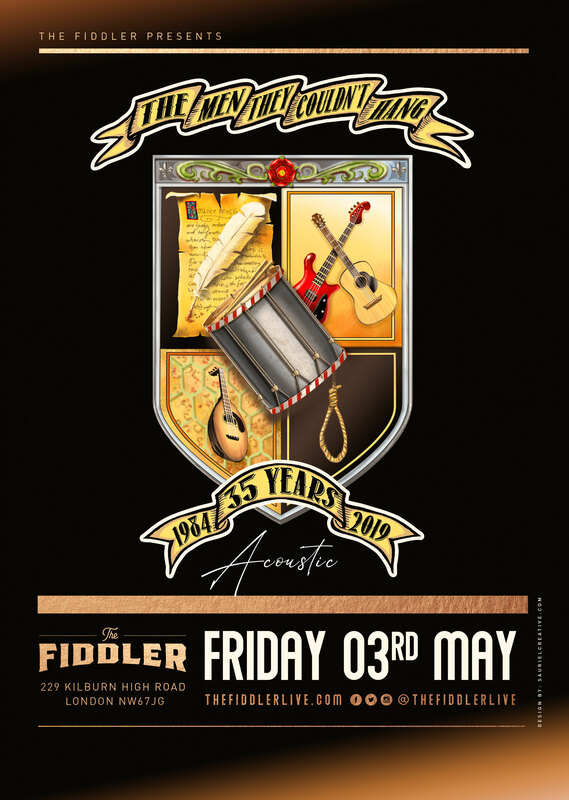 The band celebrated their 33rd anniversary with a show at Londons Shepherds Bush Empire.2019 is their 35th Anniversary and we are delighted to announce a special one off intimate show at The Fiddler.